This page Travesty is part of the queer series. Travesty is an English word used to denote generally (a) an absurd or grotesque misrepresentation, (b) a parody or stylistic imitation, (c) (pejorative) a grossly inferior imitation. A travesty, also known as a Burlesque prior to Burlesque Theatre becoming associated with striptease, is a form of musical parody in which a piece is re-arranged into a style very different from that for which it was originally known. This usually takes the form of a serious work (e.g. opera) being presented in a more populist style such as ragtime. Travesty originated in the 1840s, early in the Victorian Era, when the social rules of established aristocracy and working-class society clashed. The genre often mocked such established entertainment forms as opera, musicals, and ballet. In the 19th century, composer Meyer Lutz produced a number of operatic travesties. In these the scores were rearranged to so that operatic arias would be turned into, for example, a barn dance. Well known ragtime travesties include The Russian Rag, by George L. Cobb, which is based on Rachmaninoff's Prelude in C-sharp minor, and Felix Arndt's Lucy's Sextette based on a sextet from Lucia di Lammermoor by Donizetti. In more recent times, the score for the film The Cool Mikado is a travesty on the original Gilbert and Sullivan music. The term travesty dates from the 17th century and combines the Latin words trans-, meaning "across, over" and vestere, "to dress or to wear". These two Latin words also form the etymology of the 20th-century term transvestism. 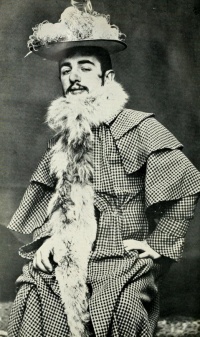 According to the Oxford English Dictionary, the word travesty originally meant "to disguise by changing costume", then "to dress ridiculously", but soon came to mean "a parody or burlesque", as in the theatrical productions discussed here, and finally added to that its modern meaning of "disgraceful imitation". Unless indicated otherwise, the text in this article is either based on Wikipedia article "Travesty" or another language Wikipedia page thereof used under the terms of the GNU Free Documentation License; or on original research by Jahsonic and friends. See Art and Popular Culture's copyright notice. This page was last modified 13:51, 10 May 2013. This page has been accessed 6,626 times.